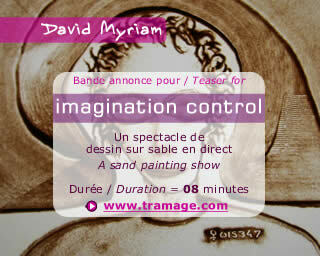 David Myriam performs the sand animation show "Imagination Control" in Carquefou, close to Nantes, France, for RIDEP festival 2009 (International Conference on press Cartoons). For a sand animation show, the artist live draws are projected onto a big screen. This sand drawing live performance was held at the "Fleuriaye" Cultural and Leisure for festival opening to about 400 people.